AutoCAD's Plot Transparency Settings Produces Large File Sizes. With the release of AutoCAD 2011 Autodesk implemented per object and per layer transparency settings. While this does allow one more options in designing drawings it comes at a price. That price is that Windows System Printers do not work with transparency this way and hence output is rasterized by AutoCAD when you enable the "Plot Transparency" option in the print dialog. Output to postscript and hpgl plotters also gets rasterized and many customers have complained about greatly increased plot time going out to their large format plotters also. Also our AcroPlot Pro and AcroPlot Jr. if you convert through our interface will create a vector PDF as long as you DO NOT set it to "Print to the PDF-XChange for AcroPlot Pro" driver on the CAD Options Tab. Because of this if you are using the "Use Transparency" option in AutoCAD 2011 and newer we strongly advise you TO NOT PRINT DIRECTLY to our PDF-XChange for AcroPlot Pro windows driver. Our AcroPlot Pro will automatically determine if you are using the "Plot Transparency" option and if so we will do an alternative output to PDF in this case. While it takes a bit longer it will give you the high quality and smaller file size you have come to expect from us. 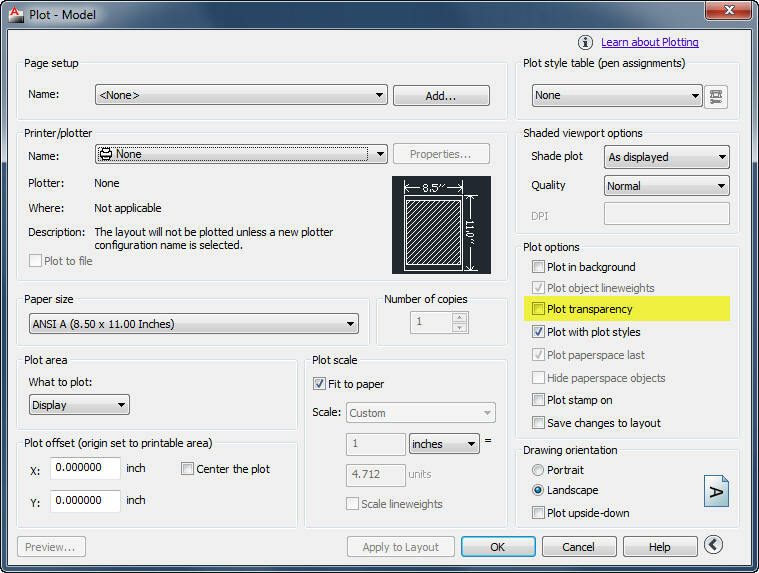 Below is a screen capture of where you can find the Use Transparency setting in the AutoCAD Plot Dialog. There is also a new AutoCAD System Variable in AutoCAD 2011 and newer which overrides your settings in the layout. PLOTTRANSPARENCYOVERRIDE. 0 = Ignores the setting in the Page Setup and forces the plot transparency off for all output. 2 = Ignores the setting in the Page Setup and forces the plot transparency on for all output. If you don't believe us here is a blog directly from Autodesk that also says it can slow down plotting.